As you may have already noticed in our Nintendo Download update earlier today, Kirby's Extra Epic Yarn has been treated to a demo today, giving players the chance to try the game out for themselves before committing to a purchase. 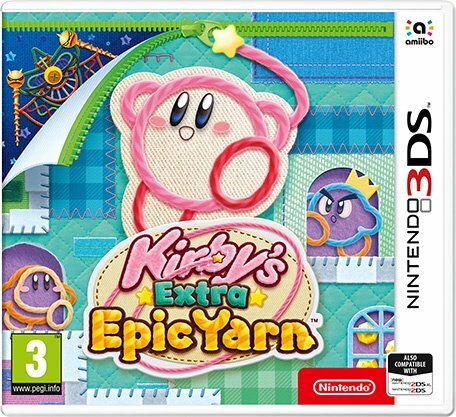 Acting as an enhanced version of Kirby’s Epic Yarn on Wii, this game transports Kirby into a world made of cloth and yarn, tasking players with unravelling enemies, unzipping secret passageways, and transforming into powerful vehicles along the way. Every stage from the original Wii version returns, but this 3DS-exclusive version packs in some new features, too. There are new Ravel Abilities that power up Kirby in fun ways, a new collection of mini-games featuring King Dedede and Meta Knight, new furniture to personalise and decorate Kirby’s Pad, and a new 'Devilish' mode that adds an extra layer of challenge to each stage. European fans can download the demo right now; it hasn't arrived in North America at the time of writing, but we're hopeful it'll become available soon. If you want to check out the game and see how it plays, make sure to give it a go. Are you a Kirby fan? Will you be cracking out the 3DS to play through the latest pink blob adventure? Let us know in the comments. No need. Kirby. I buy. Yes! I want to see how the controls work without to many motion control options. Id buy this again on Switch, but not the 3ds. It seems strange to me that they’d issue a demo a month from release. Isn’t that a bit early? @thesilverbrick I think they may have done something similar for the 3DS version of Yoshi's Woolly World, but I could be mistaken. I remember WarioWare Gold had a demo before release that came out way later in North America than it did in Europe. @Starburst Agreed, honestly. Same goes for Woolly World and Luigi's Mansion. I'm more interested in the bonus content that ups the difficulty. Loved the game... but the breezy, low stakes quality of every level caused my interest to wane as the game went on. My purchase decision will be based entirely on whether the additions allow for a more challenging play-through... and I suspect the demo won't provide an answer on that. Damn. I've modded my 3DS now so can't update. But wanna buy the game. I'll probably just wait to see if it gets good reviews then buy it blindly. I already have the Wii game which I beat just a few years ago. I'll get this game on 3DS when it's on sale sometime. Even if that might take a while. I always wanted this game and never bought it. I’m so glad I waited! Having this portable will be awesome. I heard this game is kind of easy-ish? Would you guys say so? Some say the game is kind of easy but 100%’ing the game is hard so it’s kind of hard for completionists rather than the average playthrough’er. That sounds kind of fun to me. I'd love a remastered HD Epic Yarn on the Switch. Never felt like owning a 3DS. One can always hope. Or see if it's for you with the Wii game you already spent your money on ~8 years ago! Nintendo UK Official Store's listing states that it is just one player. With the addition of actually being able to properly fail (or so it seems) alongside the few other tweaks, this could position itself right up the top of my greatest platform games of all time list. Honestly, other than not being able to properly die/fail, I really did think the original was that good. Would have loved to have seen this for the Switch though, even if in addition to the 3DS version rather than instead of it. I never got Kirby's Epic Yarn. I've thought about getting it multiple times but always ended up not buying it. Now that there's more information about the 3DS version, I'm actually interested in getting it. It seems that the "extra" in the name actually means something. I like the new things they've added. The only downside is that there's no multiplayer. I guess I have other (Kirby) games if I want to play with friends or family. The problem that I got with this game is how it's on 3DS. At this point I would rather just play the original version on my Wii U.
I think you are right on both counts. It is easy-ish but there is plenty to do to 100% it. I think you'll definitely get your money's worth out of it. @rdrunner1178 very cool! I’m going to go preorder! Thanks! Plus. The games looks good. And would have looked better on the Switch or a new 3ds. Minus. It is not in 3d. Its just a cheap port. I could not see the price. If its a budget price it could be worth getting. If its full price its a rip off. Is it full price and is ment to be a filler until some new console is announced? The Wii version was a 10/10 in my book. Just an expertly crafted experience from start to finish. The challenge comes from getting all the collectibles and gems. My favorite Kirby game and in my top 5 for the Wii. I will be buying the 3DS go. I like Kirby, but not enough to dust off my 3DS. @Toadie, I still play my 3DS a ton and your right there are so many completely amazing games on 3DS, I would even say any true gamer that has not picked up a 3DS at this point are doing an injustice to themselves and are truly missing out on one of the top three gaming platforms ever to exist in my opinion. The 3D effect is so immersive on some titles and just amazing overall still to this day there is nothing else like the 3DS it will definitely go down and rightly so, as one of Nintendo's crowning achievements . I certainly hope the Big N. don't phase out using the stereoscopic 3D effect with the 3DS. I would more than love to see a proper successor to the 3DS and the clamshell design of the 3DS like the 3D is just to amazing to phase out completely. Can you imagine a 3DS with the HD graphical power of Switch or greater and the face tracking stereoscopic 3D effect and the clamshell design for better portability, I would be a day one purchaser. Usb loader gx.....but ill still get this once it's a select. @Yosher 2018 games got discounted during the Black Friday sale last year, so keep your hopes high. Will check out the demo but sticking with the Wii version as there won't be enough to convince me to double dip. @Romeo-75 I absolutely love the 3D effect. Even after all these years it's still impressive. Unfortunately, not enough people share that opinion to warrant another system with glasses free steroscopic 3D. It's already been phased out. I would have loved it if the Switch had that effect. I just don't see Nintendo trying it again. At least not for a very long time. I love my New 3DS XL. I expect in years to come the system will become a sought after collectors item. Add it to the list already featuring Samus Returns, Wario Ware Gold and Luigis Mansion of ‘games I’d have bought on Switch’. @Alto In my opinion, it's not hard to 100%, although a little tedious. I'd also say it's not worth it to go for 100%. Anyway, the game is a lot of fun overall and one of the best looking games on the Wii. Anyone knows if this is in 3d on the 3ds? @BlueRobin04 Black Friday is barely even a thing where I live though unfortunately. Another full price cash grab from Nintendo. Granted there's more new here than in New Super Mario Bros U With Peach Sort Of, or Donkey Kong Country Tropical Freeze Funky New Mode, but there's no 3D or multiplayer. It's just lazy for a full price game (as usual from Nintendo). @electrolite77 I seriously think you are missing out. Those are some really fun games. I can't for the life of me find this demo anywhere on the 3DS eShop. @electrolite77 Fair enough, but you already have two Nintendo consoles plus that 2ds, so adding in some more 3ds games to that mix doesn't seem like it would change up the time you divide between them so much. @Toad Not out in NA yet. I've been obsessively checking! @kirbygirl I've been checking regularly too and thought I was going crazy. It's made worse that there isn't even a page for the game on the eShop. @Toad Glad I'm not the only one, lol! I think it's a shame that people are constantly crying about Switch versions of these games. I would really like 3DS games to still sell a ton, but it seems all the like 50 million 3DS owners are no longer buying games which feels weird.